I SUPPOSE that by the time these lines are published, Londoners will be flocking in thousands to the International Horticultural Exhibition at Earl's Court. It seems probable that this Exhibition will rank as one of the most successful of the great entertainments which have now become annual features there, for everything possible seems to have been done to deserve success. The grounds have been rearranged in a most attractive form, and almost every known style of horticulture will be represented. One great improvement has been made—the bazaar element has been excluded entirely, and there will be no shops, stalls, or obtrusively solicitous attendants to worry or withdraw the attention of visitors, and for the boon the British public will certainly be grateful. 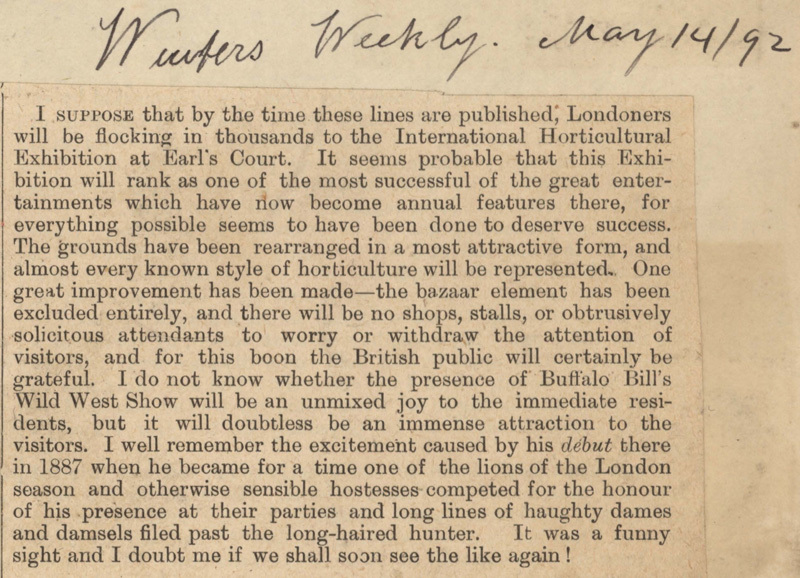 I do not know whether the presence of Buffalo Bill's Wild West Show will be an unmixed joy to the immediate residents, but it will doubtless be an immense attraction to the visitors. 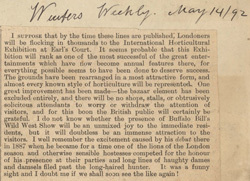 I well remember the excitement caused by his debut there in 1887 when he became for a time one of the lions of the London season and otherwise sensible hostesses competed for the honour of his presence at their parties and long lines of haughty dames and damsels filed past the long-haired hunter. It was a funny sight and I doubt me if we shall soon see the like again!